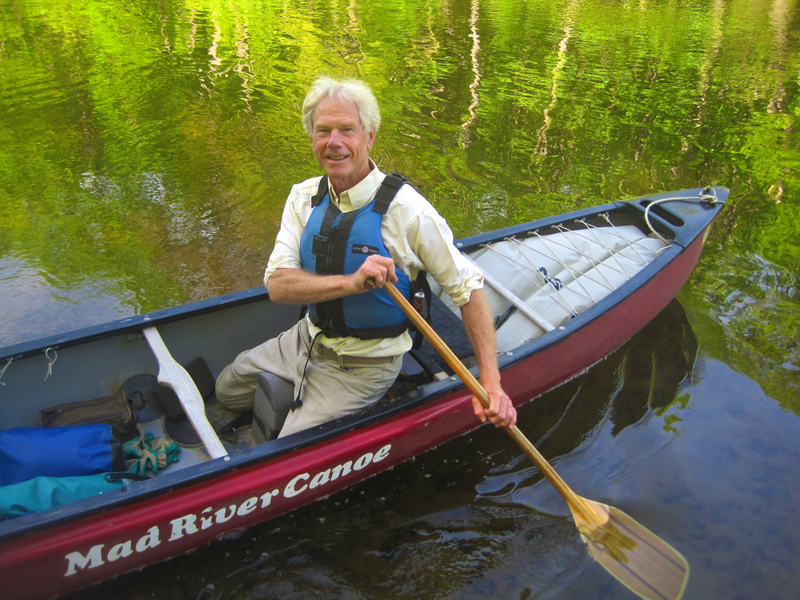 Tim Palmer, author of Wild and Scenic Rivers: An American Legacy, might have one of the coolest jobs ever. Combining his passions for photography, storytelling, adventure, conservation, and natural spaces, Tim writes masterpieces about rivers, the American landscape, and adventure travel. His most recent book, Wild and Scenic Rivers: An American Legacy, celebrates the 50th anniversary of the National Wild and Scenic Rivers Act of 1968. He gives us a taste of the wild adventure he embarked on while crafting the story of this American legacy. If I can tell stories that touch the important and the timely, I'm a happy man with a purpose in life. And let me take photographs to show natural beauty with its irreplaceable value, and I'm thrilled in a visceral and soulful way that goes immeasurably beyond the simple image in a digital file on my computer. I like to ignore the sage old writing instructor's axiom—"Show, don't tell"—by both showing and telling through the two media I love: photography and narrative. I got to do both, plus paddle on rivers to boot, while creating my new Oregon State University Press book, Wild and Scenic Rivers: An American Legacy. Let me tell you: putting this volume of text and 160 color photos together with the OSU Press staff was a total blast. For those who don't know (no worries; this group includes most Americans), the National Wild and Scenic Rivers system is the nation's, and the world's, premier means of protecting the values of natural, free-flowing rivers. The full story of this landmark conservation program had never been told, and the spectacular beauty of these natural rivers had never before been illustrated in any remotely comprehensive way. Creating a book that's half story, half portfolio, I was determined to do justice to both with immersion in a vital and photogenic topic that has held my passion for all my adult life—that's a bit of a side-story that you can also find in the book. Wild and Scenic Rivers offers a thoughtful retrospective and also a view to the future—together a timely endeavor because the fiftieth anniversary of this major but little known national conservation program comes just around the corner in 2018. The Press and I agreed that it was time to do both literary and artistic justice to this remarkable public initiative—and to these exquisite rivers along with the dedicated people who have worked to protect them. Without spilling the beans, let me tell you about one of the stories I elaborate on in the book. Stewart Udall had served as perhaps the most distinguished Secretary of the Interior ever, and years later, in 1983, we met in an unlikely coffee shop near the University of Pittsburgh, where the former secretary was in "retirement" building a case for Navajo Indians aggrieved by radioactive waste and the Atomic Energy Commission. "As a Congressman in the 1950s, I was pro-dam. I instinctively identified my values more with the Sierra Club than with dam building, except that I was from Arizona, and you couldn't go to Congress from there and be against dams." The great statesman proceeded to tell me the whole story of his remarkable transformation. With help from citizen conservationists and enlightened professionals serving under him, and with the heady rush of earthly elements whenever one kicks a boat off from shore and enters the seductive flow of a wild rushing river, Udall came to embrace the reality and the complexity of holding two opposite views at once – that some rivers should be dammed and some should be protected. As Secretary of the Interior he recognized that our treatment of rivers had been grossly unbalanced. He grew to eagerly support protection of the finest remaining undammed streams, and to battle against the mindset—and even some of the individuals—that he had grown up with as an Arizonan. Let me also tell you about the adventure of capturing one of the photos—in fact, the cover. The Snake River flowing through Grand Teton National Park is one of the scenic icons of America, and farther downstream it rushes with greater speed and urgency through Alpine Canyon—one of the West's great paddling hotspots with big-volume whitewater. I've been exhilarated by it, many times, in my canoe. But the river there is challenging to photograph because its steep trench runs east-west, and so low angles of warm sunny glow have little chance of penetrating the forested slopes, the lush green shores, the palate of eroded bedrock, and the bubbly froth of rapids. Visiting and living nearby for some years, I had failed to get the great photo that this inviting place deserved. But then one day when the summer sun rose a bit farther north, when dawn broke blue and clear, and when I scrambled down to the shore at exactly the right spot, and at exactly the right moment, I found the river rushing with speed and grace, the light glowing in the forest above, and the time precisely perfect for a photo that revealed it all. What a gift! So it went on rivers across the nation, and also in libraries, offices, and people's homes as I interviewed, researched, and photographed. It was all fun, and now it's all an honor to bring this work into the world and celebrate our nation's magnificent estate of National Wild and Scenic Rivers. I hope you enjoy the book. 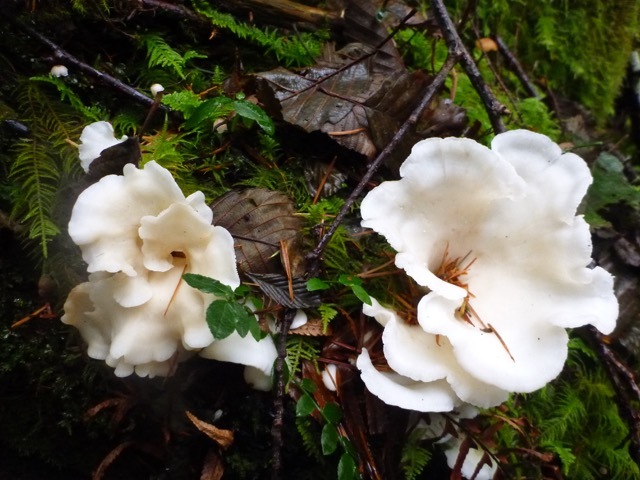 Jim Thayer, author of Hiking from Portland to the Coast, recounts the magic of combining scientific knowledge and artistic wonder while mushroom hunting in Oregon’s woods. Armed with his extensive knowledge of and familiarity with the forest and its plants, Jim searches the forest floor for his targets – chanterelle mushrooms. But the mushrooms don’t surrender easily. They camouflage themselves against the beauty of the fall landscape, playing hide and seek. Jim provides some insight into, and advice for, the exhilarating quest for chanterelle mushrooms. October is one of the busiest times in our woods and meadows. The air begins to have an edge to it and all the animals are scurrying around with newfound resolve. Outside, the first rains have fallen, and the warm winds of late September have been replaced by cooler weather sliding down from Alaska. I watch as the verdant leaves begin to fall, littering the forest floor with a light wash of yellow petals. From somewhere deep inside my bones, I feel a thrill as the forest throws off its late summer lethargy and comes alive with activity. By early October, it’s clear that nature is on the move. The first to arrive are the exotic Sandhill cranes, whose courtship dances have made them a favorite amongst bird watchers. Soon thereafter, you’ll hear that unmistakable double honk as the Canada geese descend upon our lawns and fields as if it were the Normandy Invasion. Our rivers too, are busy as the first fall runs of salmon thrust into the tributaries, pushing relentlessly to where they will lay their eggs in the fine gravel deposits hidden along the little streams. Even the spiders are busy. All summer long, the newly hatched spiders have been growing and now they’re ready to strike out on their own. Looking out across a meadow you may see spiders climbing to the top of the tallest plants, where they shoot out a lengthy strand of silk. As the gossamer thread ascends on the warm breezes, it soon lifts the spider off its perch and together they are wafted high into the sky. These “ballooning” spiders can travel miles and disperse across huge swathes of countryside. It is estimated that the worldwide market for chanterelles is worth about $1.62 billion. Prices range from $8 to more than $50 per pound. However, these market statistics completely miss the point. It’s not the mushrooms that are valuable. It’s the unique experience of hunting these clever little munchkins that is priceless. Mind you, hunting chanterelles is not an ordinary foraging exercise. It takes cunning, patience, and an eye for spotting that unique shade of yellow that signifies the emergence of a newly sprouted chanterelle. For those among you that share my passion or aspire to engage in this rustic treasure hunt, I have some advice about when and where to find the elusive chanterelles. My old German mushroom guides claim that chanterelles (“pfifferlinge”) can be harvested as early as June and as late as November. Here in the Pacific Northwest the season is shorter and begins in late September. Of course, it matters where you’re situated. The higher the elevation, the lower the temperature. As the temperatures drop, the mushrooms tend to wilt, so lower elevations can sustain mushroom growth later into the season. At the north end of the Willamette Valley, the first rains usually arrive at the beginning of October. 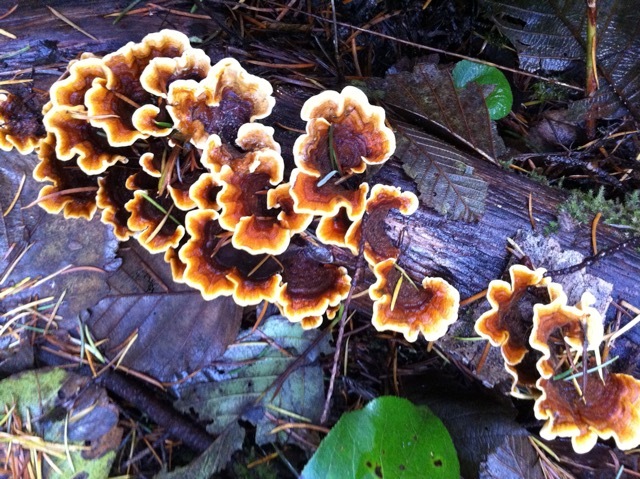 In my experience it takes another three to four weeks (from the beginning of October) for the forest fertility to advance to the point that it can produce more substantial mushrooms, such as the chanterelles or the prized matsutake. Chanterelle hunting however, requires a more proactive approach than simply counting the days until early November. Most years, I am out scouting likely locations at least three times before the chanterelles finally make their debut. Around mid-October, I begin my reconnoitering. By now the woods are wet and muddy, and little sprigs of fungal matter are beginning to pierce the duff. I know it’s too early, but the anticipation is gnawing at me and I can’t wait… Even though, I know these early forays will only uncover a handful of DBM’s. 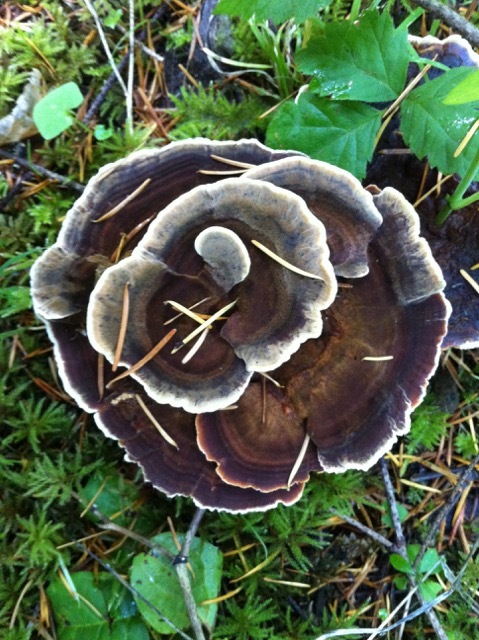 DBM’s – or damned brown mushrooms – represent most of what I find at the beginning of the season. These small mushrooms are neither tasty nor big enough to garnish a meal, and some are poisonous. So I rarely take the time to even identify them, which is why they are often lumped together and referred to by their acronym. Some of the more common fungi that lead off the mushroom parade include: puff balls, inky caps, the western red-capped Cortinarius, the clustered woodlover, the poisonous haymaker’s mushroom, and a parade of miniatures including the Marasmius and Paneolus families, and, my favorite, the tiny orange Omphalina fibula. From the typical mushroom hunters’ perspective, these small mushrooms are irrelevant but their presence identifies what stage of the mushroom procession we are observing. By late October, the woods are impassable without rubber boots. During the preceding fortnight more rain has fallen and the brilliant yellow leaves fluttering down from the alders and broadleaf maples cover the ground. Despite our efforts, it’s soon obvious that our soggy foray into the woods may still be too early. Striding through the Oregon grape and Salal bushes I can’t seem to spot the telltale apricot yellow stalks. Instead I find a host of reddish mushrooms belonging to the Russula family. Nearby, I see a family of edible milky caps in their telltale orange caps. 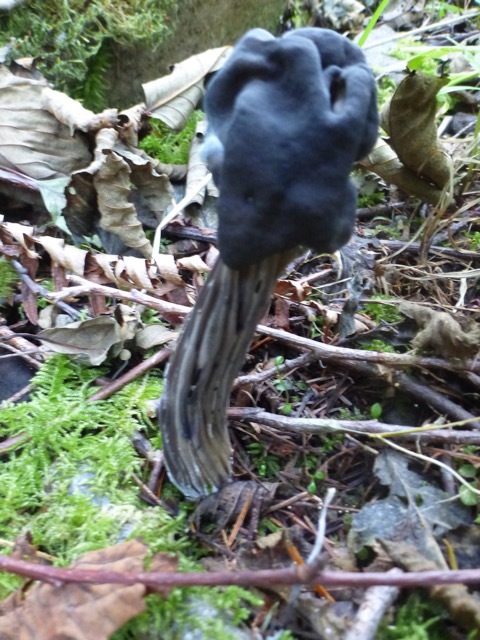 Nearby, I recognize several varieties of Tricholoma mushrooms including the edible man on horseback. 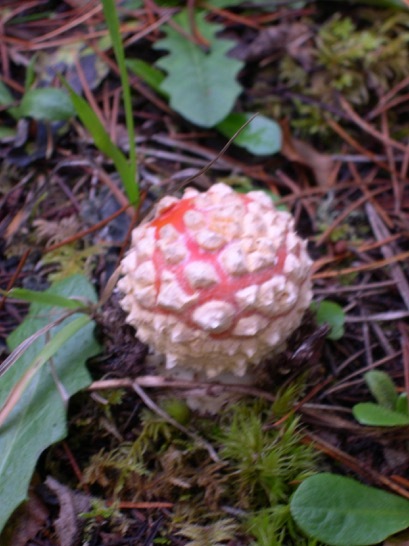 Even an Amanita pantherina has appeared with its slender stipe rising elegantly over its shorter neighbors. However, the long expected chanterelles are still eluding us. Early November: As October comes to a close, the time has finally arrived for the more solid mushrooms to sprout. Maybe it just takes longer to produce a meaty, tasty treat like a chanterelle or a Boletus edulis. At last we now begin to spot those apricot trumpets pushing through the dirt and exposing their vivid yellow stalks. By now everywhere we look the forest floor is covered with yellow leaves. Yet this is precisely the moment the cunning chanterelles have been waiting for. Cleverly camouflaged amongst the egg-yellow foliage, the chanterelles now stretch out their necks and spread their trumpets – making them an easy mark for a predator like myself. Where there’s one, there’s probably at least two more – or so I tell myself as I go crawling through the soggy underbrush. It does seem that chanterelles like company but more likely these concentrations imply a preference for a certain kind of forest floor. Usually, I can find chanterelles in stands of older Douglas fir trees, or even younger stands (20 years) that have been planted so tightly that little sunshine can penetrate and the forest floor is in deep shade, covered with pine needles. Typically, they congregate where the slope is mild and may host a more productive patch of mycelium. The mycelium is an extended subterranean network of mycorrhizal links between the plants, mushrooms, and the entire forest. If you dig up the forest floor you may spot little white threads that permeate the earthy loam. These are the veins of the mycelium that carry vital minerals to the trees and in return receive vitamins garnered through the photosynthesis occurring in the sun lit treetops. Finding a productive patch of forest that sprouts mushrooms with regularity is probably indicative of a healthy carpet of mycelium. Over time, I’ve developed an “eye” for spotting forest habitats that seem more likely to harbor an active mycorrhizal network. This woodsy intuition notwithstanding, most of my success identifying good chanterelle hunting grounds is probably 25% patience, 15% deduction from the type of soil and tree coverage, 10% smell (many of my most productive sites have an earthy, fungal odor), and 50% luck. It’s the very unpredictability of this quixotic endeavor that makes it all the more enticing. Today Ken Coleman talks with us about his new book Dangerous Subjects: James D. Saules and the Rise of Black Exclusion in Oregon. Dangerous Subjects is Ken’s first published book and explores the unique story of James D. Saules, a black sailor who settled in Oregon in 1841. OSU Press: Briefly describe your book Dangerous Subjects. Coleman: It’s an account of what I refer to as the “Americanization” of Oregon centered around one person. The Americanization of Oregon was a colonial process that began when Anglo-American farm families began arriving in the region in large numbers in the 1840s. In some ways, it’s a story that’s been told many times before, but most historians have either focused on American settlers or—in recent years—indigenous or mixed-race communities. Instead, I was interested in how the arrival of the Oregon Trail immigrants coincided almost immediately with a series of laws banning black people from living in Oregon. I centered my narrative on one man, James D. Saules, someone whom historians have either ignored or treated as a peripheral figure in early Oregon history. Saules was a black man who settled in Oregon two years before the first major wagon trains arrived, and is most often cited as the man who inspired Oregon’s first black exclusion law. The book is not only about the local and national context of Oregon’s early black exclusion laws, but about how Saules coped with and adapted to massive social, political, and cultural shifts in Oregon. OSU Press: What about James D. Saules’ life initially drew you in to his story? Why did you originally feel compelled to write this account of his life? Coleman: When I began researching black exclusion in Oregon several years ago, I was struck by how often Saules appeared in the historical record. Truth be told, compared to white elites of the same period, it wasn’t much. But for a member of a racialized minority like Saules, it was significant. Secondly, Saules was a sailor. Oregon’s black exclusion laws and the rhetoric political figures used to support them often singled out black sailors as a particular threat to the nascent American settlement. Many suggested that black sailors would incite Native people to violence against white settlers. I knew Saules was actually arrested for doing just this, so I tried to find out as much as I could about him. It turned out he lived an extraordinary life, and the more I found out about him, the more his life took on an epic scope. OSU Press: Why study the colonial and racial history of the Pacific Northwest through the eyes of this particular figure? What, if anything, does that do for the account of history? Are there concerns with limiting the perspective to one particular individual or does it provide a unique opportunity? If so, why? Coleman: I don’t think it’s possible to “see” history through the eyes of a historical figure, since we only know historical figures through textual evidence. This is made more difficult since most of evidence about Saules was written by white elites, and I come to this subject as a privileged twenty-first century white male. That being said, once I narrowed my focus to Saules, ironically the story became much bigger and I was able to connect Saules to larger national and transnational historical processes. Saules was a free black man from Connecticut who had worked as a whaler in the South Pacific and later served as a cook on the United States Exploration Expedition, a naval voyage of discovery unprecedented in size and scope. This led me to research such topics as the nineteenth-century international maritime economy, merchant capitalism, U.S. and European imperialism during the Age of Sail, and the experience of black people who worked aboard sailing ships. These were all topics I doubt I would have encountered had I researched and written the book as a more local study of race relations in Oregon. For instance, by focusing on Saules, it became even more apparent that the United States was shifting from a maritime nation to one that looked to its own interior for economic resources. This fact would have a major impact in Oregon, and Saules was present when these changes occurred. I also learned that legislation targeting black sailors for exclusion was not unique to Oregon and was common in other parts of the United States, particularly the American South. Historians who grapple with issues relating to race, class, gender, and sexual orientation often face a dearth of sources about the lives of specific people whose lives were affected by these axes of inequality. And as I mentioned before, most readily-available primary sources from the first half of the nineteenth century are written by white elites: government officials, military officers, journalists, missionaries, merchants, financiers, etc. Because of this, social historians have to read existing sources against the grain and often have to generalize to address silences in the historical record. I certainly wasn’t immune to this. As I wrote this book, I had to generalize, speculate, and engage in deductive reasoning to try to fill in the blanks. But when you focus on one person, I think you can keep generalization to a minimum and write about topics like black exclusion and white supremacy not as abstract historical processes, but as very real things that involved and affected very real human beings. For the reader, I hope this makes this account of history more intimate and less abstract. OSU Press: Why publish this particular account today? What kind of impact do you hope this book will make? How do you hope this book to be received? What kind of audiences do you hope to reach? Coleman: As I wrote this book, the phrase “black lives matter” and the activism around it entered into the American consciousness after the death of Trayvon Martin. My simplest answer is that I hope this book makes some contribution to the notion that the black lives mattered in the past as well. When I began researching this project in 2011, certain political commentators were still describing the United States as a “post-racial” nation, that somehow the election of Barack Obama proved that white supremacy was a thing of the past. Obviously, this claim is belied by almost everything that has occurred since, not the least of which was the election of a president who made racial fear and scapegoating the centerpiece of his campaign. On a more local level, my hometown of Portland, Oregon in the same Willamette Valley where Saules once resided remains one of the least racially diverse cities in the United States in a region—the American West—increasingly defined by its ethnic diversity. I insist this lack of diversity was by design, not happenstance. The United States is a nation founded on the theft of indigenous land and the labor of enslaved human beings, and white supremacy and ethnic cleansing was central to U.S. imperial expansion. Yet I insist that racism is not an ahistorical aspect of human nature, and race itself is a social and historical formation. Because of this, I believe it can be overcome. But it can’t be eradicated overnight by the election of a president, and it won’t be overcome unless we begin by taking an honest and clear-eyed look at our collective past. Therefore, I think it’s essential that Americans in general and Oregonians in particular remember that they live in a colonized space. A phenomenon like the Oregon Trail should be viewed as more than the heroic trek of hardscrabble pioneers. It was also a tactic of American imperialism in which Anglo-American settlers imposed their own racial and social order with little regard for the Native, mixed-race, black, and Pacific Islander people who lived there. Yet the task of a historian is to understand the past rather than pass judgment on historical actors. I think my account of Saules’ life and times complicates tidy narratives. Such as one of my central points, that Saules was both an agent of empire and a victim of it; for white settlers, he occupied a liminal state between colonizer and colonized. Furthermore, historical forces like colonialism, racism, and capitalism are multifaceted and dynamic, and historians need to track these changes. As for an audience, I am trained as an academic historian, but I wrote the book to appeal to an audience beyond academia. I tried to keep jargon and esoteric references to a minimum in an effort to connect with readers of any background. In particular, I hope high school and college students could read the book and come away with a solid understanding of Oregon colonial past and present. OSU Press: What insights do you have after publishing this book with the OSU Press? Coleman: This was my first book. And I’m sure just about every first-time author has the same thought: If I ever have the opportunity to write another one, I would do just about everything differently. In particular, I eventually learned how crucial it is to not lean so heavily on digitized sources. It’s important to get off the computer, leave the house, hit the physical archives, and, most importantly, talk to a wide variety of people and actually listen. It was through these personal interactions that I had my biggest breakthroughs. Another major lesson I learned through working with OSU Press is that regardless of the fact that my name is on the cover, writing a book is a deeply collaborative process. Once my rough manuscript began passing through the hands of various readers, reviewers, and editors, it kept reemerging as something different and far stronger. This can be a painful process, especially when criticism strikes a raw nerve, but it improved the book significantly. The impetus for Larry Lipin’s most recent book, Eleanor Baldwin and the Woman’s Point of View, came while researching his previous book. Like an earworm that couldn’t be shaken, Larry kept coming back to Eleanor Baldwin’s story as a radical female journalist from Portland, Oregon. His book takes a nuanced and complicated look at Baldwin’s compelling, and at times seemingly paradoxical, intellectual journey in the previously forgotten account of Portland’s Progressive Era. Below, Larry gives us a glimpse into the contradictions within Baldwin’s character that made her so worth writing about. I first came across Eleanor Florence Baldwin while researching my book Workers and the Wild (University of Illinois Press, 2007) that explores Oregon labor and its changing relationship with nature. Baldwin had written a letter to the editor of the Oregon Labor Press (OLP) defending the right of poor working people to augment their wages and to provide some healthy leisure outside of the degradations of the workplace by fishing; she came out in support of measures that would limit the commercial take of salmon on the Willamette River. A little later I came across a few other of Baldwin’s letters that spoke to some of the more divisive issues that made their way into that newspaper’s pages, notably defenses of the Bolsheviks and the anti-Catholicism that would be associated with the KKK. The OLP’s editor, Clarence Rynerson, had denounced the Klan as an anti-labor organization when it first appeared, but as the Invisible Empire grew more powerful in Oregon, the OLP grew more silent. It became evident that the solidarities of the trade union movement, like those of Oregon in general, had been rent apart by the Klan. Yet, Baldwin’s simultaneous support for Bolsheviks and Klansmen caught my attention. Enough so that while waiting for some materials at the Multnomah County library, I used their extensive card index (as quaint as that sounds) for individuals who appeared in the local press to seek out some information about this odd person. That led me to her obituaries. It was then that I learned that Baldwin had been a female writer who for three years put together a daily woman’s column that had appeared on the editorial page of the Portland Evening Telegram between 1906 and 1909, that she honored the abolitionist memory of her minister father, and that she was a monetary theorist of sorts who brought nineteenth century greenbackism and anti-banker sentiment into the early twentieth century. This made her seem all the more interesting, as this Klan supporter had continually honored her family’s abolitionist stature. Yet, there were things holding me back from committing to this project. Noting that her monetary tract—and a subsequent unpublished sequel—were held in the special collections department of the University of Oregon library, I drove from Portland to Eugene to read her tract. In it, Baldwin sought to convince her readers that money was a “force” and not a mere medium of exchange; I duly noted the argument, but came away unimpressed. The cultural use of electricity as a metaphor for both the human body and mind were familiar to me, but not that interesting. Still the contradictions of her biography bothered me and would not let me completely leave it at that. I decided I needed to read the columns. After taking notes on many of them, I decided that this project was not worth the time that would be needed to read all nine-hundred columns, so I began to photocopy them off the microfilm reader. I knew I had a sabbatical coming up in the next couple of years and that I could use that to make sense of them. Desiring searchable data, I found a student of mine to transcribe them into word documents. That student, Caty Prechtal, soon came to know Baldwin better than I did; some of her email messages with transcribed documents came with exclamations of how interesting she was. As Ms. Prechtal had taken my Victorian gender and sexuality course at Pacific University, she knew the context in which Baldwin had lived and these expressions of interest were reasonably grounded. Her emails slowly but surely caught my attention, and so I began to read the columns in earnest. What I found was a remarkably progressive woman, which did nothing to blunt the contradictions that I had originally found and which continued to perplex. But other things came into sharper focus. The columns made clear that Baldwin was an adherent of the emerging “New Thought” religious tradition, and Portland, I soon learned, had been a center for women who had moved into this religious belief system from spiritualism. New Thought came out of mind-cure circles in New England; it was significant enough to capture the attention of William James who wrote about it in his Varieties of Religious Experience. The gist was that the focused mind could not only cure the body, but that the collective mind could cure society of its illnesses. Though the tradition would eventually move towards the kind of mainstream religion as offered by Norman Vincent Peale or what some call “prosperity gospel,” in Baldwin’s day it nurtured a number of socialists who believed that the mind could bring forth a socialist utopia. This tradition was evident in many of her columns, as was her friendship with other local practitioners like Lucy Rose Mallory who published a monthly newspaper that melded together spiritualism, left-wing populism, and New Thought for decades, and the woman’s right activist, Clara Colby. I was pretty much convinced that I needed to write about Baldwin, if for no other reason than to alert others to the vitality of this tradition. And, thus, I was motivated to return to Eugene to one more time go through her papers regarding the nature of money, and what I had previously thought had been incoherent became much clearer: Baldwin had been translating greenback labor theory into New Thought language. Her final and unpublished manuscript, written in the early 1920s as she was writing her defenses of both Bolsheviks and Klansmen, sought to reinvigorate the socialist possibilities in New Thought against the more individualistic and consumerist direction to which it was inevitably tending. All of a sudden, the incoherent and uninteresting was transformed into a fascinating, if unsuccessful attempt to adapt nineteenth century religious and political traditions into a meaningful political and spiritual statement for the developing mass consumer society of the twentieth century. And in this way I committed to Eleanor Baldwin and the writing of this book.